I know you want to know how much it’s going to cost to have me come to your school. I’ll admit, I’m probably not the cheapest assembly you’ll book this year. Sometimes it seems to the PTA/PTO Folks and Educators that I charge a lot. In other venues, I typically charge 2 and 3 times what I charge for my school shows. In the corporate market I actually have to charge more like $3,500 a show just to be seriously considered. Weird huh? The fact is that I charge a lot less for my school shows than my corporate shows and I believe my fees are fair. I continue to pursue work in the Educational market because I love having the opportunity to positively influence thousands of young people every year. In other words I’m not just in it for the money. And I still live in the real world where I have to make a living. I think it might be helpful for you if you consider that the performance you are booking is literally the tip of the iceberg. printing and mailing services or on occasion licking envelopes, applying stamps and schlepping to the Post Office. Developing publicity materials, including, but not limited to, press releases and web-site maintenance… See this website? Yup. I do everything on it. See any typos? Let me know! Traveling to and from shows, loading and unloading equipment. That’s all about Time. Now Let’s Talk about actual Money. Business Expenses. I’ve been practicing and honing my skills as a songwriter, storyteller, guitarist, drummer and performer for over 30 years. What does an educator with 30 years of experience get paid? Add up all their benefits and paid vacation time. What’s their hourly rate? Now multiply their rate by the 10-30 hours I’ll spend traveling to your school, unloading, setting up, performing, breaking down packing up…driving back. Plus I am responsible for all my own dental and medical expenses in addition to all the business expenses a teacher doesn’t have. Also consider that just being away from home and on the road is more demanding of a person’s energy than being at home and working in the same location each day. When you take the students off of the school property to a cultural event what is the cost? If you take them to a live theater performance what do tickets cost? Even a movie today costs $10 dollars. And kids see movies all the time. What’s so educational about that? What about live theater? What does live theater cost? More. Assuming a special $10.00 per student price, That’s $3,000 plus you also have the cost of the buses, insurance, permission slip hassles, etc. If you have more than 300 students just do the math. So to have the performer come to you is convenient and it actually saves you money and hassle even if you paid the same price. Many of your students will never see a live performance of any kind other than perhaps a rock band in their lifetimes. This is particularly true the farther away from major metro areas you get. To expose your students to art forms that are different and creative as well as of supremely high quality is as legitimate a learning experience as anything they are exposed to in their regular classes. What is that worth? 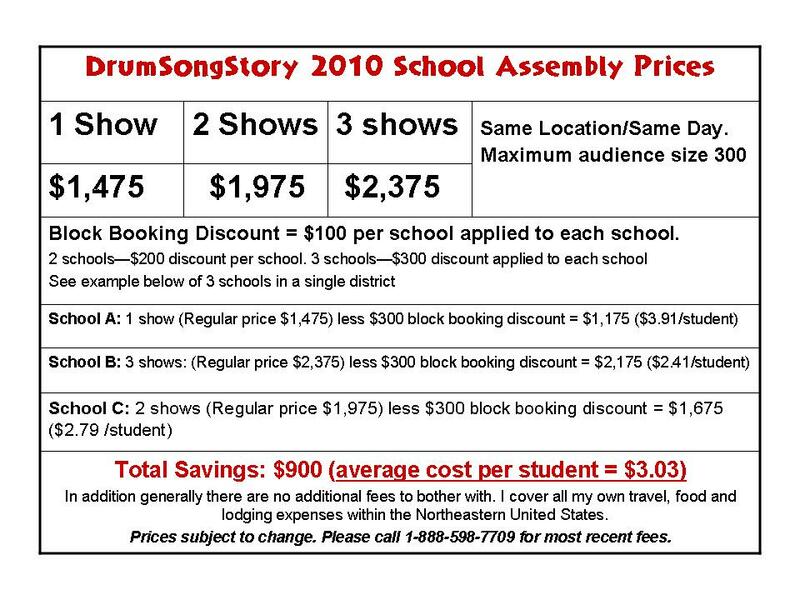 What’s the return on that investment if 300 students experience something like DrumSongStory and remember it for the rest of their lives? The very idea that a guy can totally invent his own job doing things he loves to do is revolutionary! Kids need to be exposed to the fact that not everybody has a “JOB”. The idea that Artists can actually make a living doing their art is something kids don’t get a lot of exposure to other than the really huge mega stars that make millions. Kids need to be exposed to real people who are making a living doing what they love. Of course it’s only possible with a full array of business skills. Most of those I learned the hard way and through often expensive professional development courses. I’ve seen incredible educational performing artists totally undercharge for what they do. It’s heartbreaking to see them giving so much of themselves and barely surviving. On the other hand, I’ve seen authors come in and simply read a bit of their book and answer questions who are charging $2,500 for a single assembly. They have no interactive abilities or audience management skills. But they do have an agent (who gets a big chunk of the dough) ! Finally there is another area that few people consider when evaluating the fairness of a performer’s fee. The ability to draw an audience. This doesn’t really apply to school assemblies but it does apply to family concerts or other events where you are seeking to attract an audience. My DrumSongStory programs are attractive because they are so different. Newspapers who receive my press packets routinely print my colorful promo pic collage because it is interesting and unusual and generates interest in your event. That can significantly affect turnout. Another piece of this occurred to me one day as I had a conversation with someone who said, “yeah because he was expensive, we knew we had to really put forth our best efforts to do our part to get the word out”. people into the seats. But if you are on the hook for $1,500 or more you will definitely take that more seriously. It seems to be human nature. I’ve also noticed this with my NLP students and private coaching clients. Whenever I bend over backwards to make it easy for them to afford it, a good percentage of them don’t follow through. The folks who pay full price and don’t haggle about the fee typically are more committed to get the most value out of their investment. Ultimately I do my darndest to provide more value than I’m paid for. I seek to make your experience with me as positive as I can humanly make it. One way that I can significantly lower your cost is by performing at multiple schools in your district. As an incentive, each school receives a $100 discount per school that books me. This also applies if you facilitate a booking in your area that is outside of your actual district. I can lower my fees significantly doing multiple schools because it lowers my travel and lodging costs significantly. I’ve put together a chart below that hopefully makes it simple for you. I hope this rather long explanation is helpful to you. The bottom line is that I have dedicated my life to making a positive lasting difference in the world through my words and music. One significant way I do that is through my school shows. I don’t do school assemblies because I have to. I do School Shows because I want to. That being said I also congruently believe that I serve my audiences well by charging enough to pay my bills and take care of my health. Perhaps the most important aspect of what I do and the hardest to put a price on, is to model for young people, from Kindergarten right on up to 12th grade, that Learning is a lifelong process. School teaches us many vital life supportive skills. But the school environment is well known for being predominantly designed for visual and auditory learners. A lot of kinesthetic learners get left behind. The Multiple intelligences are often difficult to address in traditional ways. Interactive, multi-sensory, creative learning experiences are not a luxury. They are vital to the healthy development of the next generation of leaders and problem solvers. Let’s work together to touch the lives of your young people in a positive way that will continue to encourage and support them in their life journey. 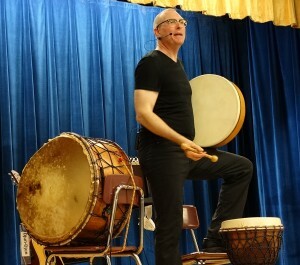 Elementary School Assemblies – Assemblies, Family Concerts, Staff Development Programs throughout CT, RI, MA, NY, PA, NH, VT, ME for Elementary School audiences. Middle School Assemblies – Assemblies, Family Concerts,Teacher Development Programs throughout CT, RI, MA, NY, PA, NH, VT, ME for Middle School audiences.